A North Carolina-based air freight company has halted flights to Venezuela following a report by McClatchy linking it to possible arms smuggling. 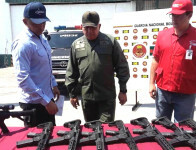 Last week, Venezuelan authorities claimed they had uncovered 19 assault weapons, 118 ammunition cartridges and 90 military-grade radio antennas on board a U.S.-owned plane that had flown from Miami into Valencia, Venezuela’s third-largest city. The Boeing 767 is owned by a company called 21 Air based in Greensboro, North Carolina. The plane had made nearly 40 round-trip flights between Miami and spots in Venezuela and Colombia since January 11, the day after Venezuelan President Nicolás Maduro was sworn in to a second term. The flights ended after McClatchy first reported on them. Venezuela accused the U.S. government of sending the arms as part of its attempt to topple the Maduro government. While no definitive links between 21 Air and the U.S. government have been established, McClatchy reports the chairman of 21 Air, Adolfo Moreno, as well as another employee at the company have ties to Gemini Air Cargo, which was involved in the CIA’s rendition program during the administration of George W. Bush. We speak to McClatchy reporter Tim Johnson, who broke the story. Johnson was part of a team that shared a 2017 Pulitzer Prize for its investigation of the Panama Papers. AMY GOODMAN: 21 Air has denied knowledge of the arms shipment, saying the flight had been chartered by another company called GPS-Air, which also denied sending arms. While no definitive links between 21 Air and the U.S. government have been established, McClatchy reports the chairman of 21 Air, Adolfo Moreno, as well as another employee at the company have ties to Gemini Air Cargo, which was involved in the CIA’s rendition program during the administration of George W. Bush. In 2006, Amnesty International identified Gemini as a front company that had authorization to land on U.S. military bases worldwide. The CIA has a long history of running front companies for covert actions. Most famously, the CIA ran a front airline called Air America, which operated from 1950 to 1976. In the ’80s, a CIA front company called Southern Air Transport was used to send arms to the U.S.-backed Contras in Nicaragua. We’re joined now by Tim Johnson, who has been reporting on the story for McClatchy, joining us from Pennsylvania. Welcome to Democracy Now! Tim, would you lay out what you found? TIM JOHNSON: Well, as you mentioned, this air charter company, 21 Air, went repeatedly to places in Venezuela and Colombia starting January 11th. Prior to that, it had largely operated domestically, and suddenly it began to change its patterns. And often there would be even two flights a day between Miami and places in Colombia or Venezuela. I actually learned about this from somebody who tweeted about it. A gentleman in Canada who follows ship and plane movements noticed this, and we started looking into the history of the chairman of 21 Air and saw that he has a number of businesses. And two of those businesses used an address in northwest Miami that were previously used by a subsidiary of Gemini Air Cargo, which, as you mentioned, was listed in that Amnesty International report as having participated in renditions. 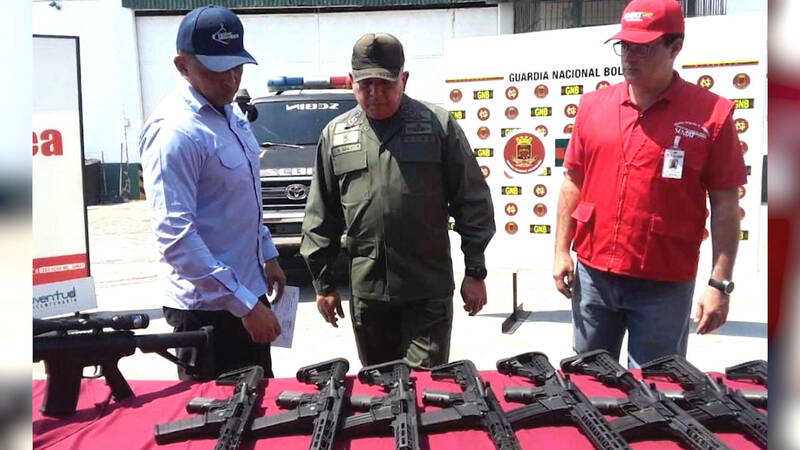 JUAN GONZÁLEZ: Now, Tim Johnson, a Boeing 767 is a pretty big plane, and the cache of weapons that the Venezuelan government claims they found, while they’re clearly lethal weapons, is not a huge shipment. I’m wondering: Do you have any way of being able to tell what the manifest of this flight, as well as the other 39 or so flights that this airline engaged in—what they were claiming to hold? TIM JOHNSON: I actually don’t know. We’ve tried to get that, and we haven’t been able to get the manifests yet. So, you know, what was aboard the other flights going to South America, we don’t know. This is a very puzzling case. If you look on social media and dig into the backgrounds of employees of 21 Air and associated companies, you see that there are many accounts of employees who follow the Venezuelan opposition, and opposition accounts that follow them, as well. So, there’s certainly some sympathy from employees within the company to the opposition to Maduro in Venezuela. AMY GOODMAN: Talk more about the leadership of the company that you investigated, based in North Carolina. And explain what you mean when you talk about the links to rendition under President George W. Bush. TIM JOHNSON: Well, Adolfo Moreno is a 75 percent owner of 21 Air, and he’s got many other companies, but he’s been involved out of Miami. I don’t know—while the company is registered in North Carolina, the operations really are out of Miami, as far as I can tell. That’s where many of the flights have been operated. They have a huge operation center at Miami International Airport. A curious secondary aspect of this story is that the company that consigned the cargo also has tangential links to, you know, this historical—the Iran-Contra affair. The head of GPS Air is a man named José Manuel Calvo, and he, like Moreno, has many companies. And one of those companies, with the partner that he used to create this company, is a company called Heavylift Air. And that company has a subsidiary out of the UAE that is controlled by in Iranian American named Farhad Azima, who also had a role in Iran-Contra. So there’s all these circumstantial things, but there’s really no smoking gun, that I could tell. You know, this may be just circumstantial. AMY GOODMAN: Are you reporting this new now on Iran-Contra, what you’re saying? And explain, for people who aren’t familiar with the Iran-Contra scandal, this happening under the Reagan-Bush years, the selling of weapons to Iran to take that money to support the Contras in Nicaragua, which violated U.S. law, the Boland Amendment. TIM JOHNSON: Yes. So, that scandal involved Southern Air Transport, which also was a CIA front company. That really exploded into the news back in 1986 because the Sandinista army shot down a twin-engine plane that was run by Southern Air Transport, that was taking armaments to the Contra rebels fighting in Nicaragua. So, Southern Air Transport was actually heavily involved in all the arms shipments to Iran and from the Middle East to the Contra rebels in Nicaragua. JUAN GONZÁLEZ: Well, I want to ask you about Eugene Hasenfus, who you mention in your article. In 1986, he was aboard a U.S. plane that was shot down in Nicaragua while on a secret mission to bring arms to the Nicaraguan Contras. He the only passenger to survive. I want to turn to a documentary made by Wisconsin Public Television called the The Eugene Hasenfus Story from 1991. It featured an excerpt from the station’s initial coverage of what happened to him in 1986. REPORTER: A Wisconsin man has been the focus of international news this week. Forty-five-year-old Eugene Hasenfus of Marinette was captured in Nicaragua after his cargo plane was shot down. At a press conference Thursday, Hasenfus said his mission was directed by the CIA. But U.S. officials say the flights were privately directed. Mrs. Sally Hasenfus joined her husband in Nicaragua this week. Hasenfus has been jailed and may stand trial. JUAN GONZÁLEZ: The documentary also featured an interview with Eugene Hasenfus’s wife, Sally. JUAN GONZÁLEZ: And interestingly or coincidentally, Elliott Abrams is now the special envoy of the White House to Venezuela. I’m wondering your assessment of this affair back then, the impact it had on what was going on at the time, in terms of the war on the Contras? TIM JOHNSON: I’m not sure I can really speak to the historical impact. But, of course, it—you know, I think it helped lead to a negotiated settlement, leading to the elections in Nicaragua in 1990, because it was, you know, clearly a major impact on that. But I really couldn’t speak further to that. AMY GOODMAN: But this whole issue of Eugene Hasenfus, this former marine, a mercenary, shot down over Nicaragua, then held by Nicaragua, eventually released, and his contact with the U.S. government at the time, and now you raising this issue in your current piece around the arms shipment that was found going into Venezuela—not clear exactly if there’s a connection to the U.S. government, but clearly the U.S. government is very overtly supporting the attempted overthrow of Maduro, explicitly, and these flights starting a day after Maduro’s inauguration on January 10th. TIM JOHNSON: Well, yes, there’s a lot of these coincidental links, and it’s worth paying quite close attention to. Again, I use “coincidental” only because we don’t really know. You know, other people point out to me that there are many people that could have a vested interest in this, whether the arms were really aboard that plane. Or, is it possible that this was something that was ginned up by the Venezuelan government to rally support for Maduro? I don’t know. I just—we haven’t been able to determine for a fact that those weapons were loaded aboard that 767 in Miami, that somehow they passed through the normally rigorous screening by TSA for air cargo. These are things that are just yet to be investigated. JUAN GONZÁLEZ: And has the company answered in terms of—as you mentioned, they normally were not traveling to Venezuela and Colombia—the 40 flights, what they were actually carrying, or are they saying they just didn’t know? TIM JOHNSON: Both have been very limited in what they’ve said, other than denying that they knew what the cargo was. Generally, an air charter company would trust the consignee of the freight to handle any declarations, I believe. And for its part, GPS-Air said, well, it was—you know, it doesn’t know what was in the cargo. AMY GOODMAN: And finally, back to that issue of rendition, though you don’t know exactly who this company was working for, what you do have a record of is the company being involved with the U.S. government during the President George W. Bush years, being involved with rendition and having clearance to land on any military base in the world. Can you explain what those renditions, so-called, what some called kidnappings, were about? TIM JOHNSON: Well, basically, the renditions were to take terrorist suspects, following 9/11, for interrogation in black site jails scattered around the world. There were a number of them in Eastern Europe. I know there was one outside of Chiang Mai, Thailand, elsewhere. And these were used to, you know, forcefully interrogate, waterboard even, suspects in the war against terror. So these rendition flights were commonly used in the period after 9/11. AMY GOODMAN: Well, I want to thank you so much for joining us, Tim Johnson, McClatchy reporter who’s been covering national security and technology issues since 2016, his recent article headlined “Venezuela says plane from Miami delivered weapons for use by enemies of Maduro.” Tim Johnson was part of a team that shared a 2017 Pulitzer Prize for its investigation of the Panama Papers. Earlier in his career, he spent two decades as a foreign correspondent in Asia and Latin America. We’ll link to your piece at democracynow.org. When we come back, None of the Above: The Untold Story of the Atlanta Public Schools Cheating Scandal, Corporate Greed, and the Criminalization of Educators. Stay with us.